The holidays have come and gone, which means a lot of quality time with family we may not see all that often. For many families, it’s a lovely time of year. But we have to acknowledge that, for some, family time isn’t such a good thing. I sometimes feel that our culture generally doesn’t acknowledge the work involved in the care and keeping of family. And I think a lot of the misconception comes from the works we absorb when we’re younger. A lot of stories aimed at children either give a pleasant picture of family, the only problem usually a lack of appreciation, or are about finding family rather than dealing with one you already have. Serious family issues come up later in YA and adult works, usually with a dose of crudeness and cynicism. But if we started talking about these things earlier, in a constructive way, maybe it could help kids to understand and defend against stressful family situations earlier. Family entertainment in general has made strides in recent years with depicting different types of families, such as mixed family and single parent situations. But there are certain works that do an exceptional job at dealing with the complexities of family in a clear, concise, and constructive way. The Harry Potter series, I think, is definitely one of them. 1. Love is the strongest force in Rowling’s Wizarding World, and love and family are closely connected. 2. Rowling develops her characters so thoroughly that she knows the family background of even the supporting characters. This family background often influences the characters’ decisions and values, either in support of or against the way they were brought up. The characters feel real because, just like us, they are effected by their families, but can still make decisions and grow to be better. Now, I’m not saying family can’t be made of people you aren’t related to or grew up with. I mean Ron, Hermione, Dumbledore, and the Weasleys all became Harry’s family, James became Sirius’s family when Sirius ran away from home, the Marauders became Remus’s family when they protected his secret and kept him company on the full moon. But, as stated above, the relationships a person has with the people they grew up with, who often are blood related, can effect much of their decisions and outlook, and thus, for better or for worse, we have to deal with and understand these people. The Weasleys are awesome. Let’s get that out there first. The Weasleys, though poor, are warm, caring, and have love to spare. They are the polar opposite of the cold, judgmental Dursleys Harry grew up with, and one of the best things that could have happened to him. But the Weasleys, happy and functional as they are, are not without their problems. We see that most exemplified with Ron Weasley, who often feels inadequate compared to his older brothers, and later to Harry and Hermione. Though the Weasleys clearly love and support Ron, with so many siblings it’s hard not to get lost in the shuffle. What is merely preoccupation with other things is misconstrued by Ron in his darkest moment as his mother not loving him as much. 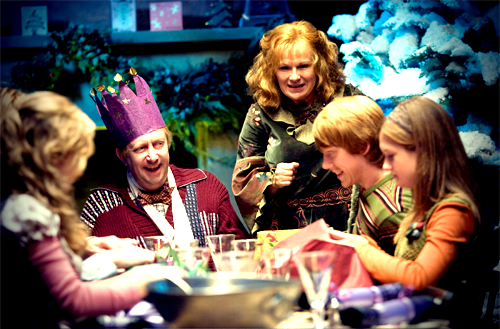 Percy Weasley also probably felt left out of his family, not because his family didn’t care or love him as much as the others – we know Mrs. Weasley was proud he was Prefect and Head Boy – but because he was just a little hard to relate to compared to his more genial family. Thus he felt a strong need to prove himself, leading him to abandon his family for the Ministry of Magic. But in the end, both are able to overcome their insecurities and come to a better place. If even a family as awesome as the Weasleys can be plagued by doubts and experience periods of turmoil, we can take hope when things get rocky in our families that, with understanding, things will be okay again. We sometimes pick up the worst traits from our family. In Harry Potter, Rowling featured two parallel characters who emulated awful parents, to their own detriment: Dudley Dursley and Draco Malfoy. Dudley and Draco are both spoiled from a young age, encouraged to believe they are special, that others are less than them, and that they deserve anything they can get their hands on. They model themselves after their fathers’ examples, and become huge bullies, particularly to Harry. Draco in particular is brought up with the assurance that the Malfoys will rise to their rightful place once the Dark Lord returns. But each of them get a rude awakening – Dudley in facing the dementors, and Draco in facing the task set for him by Voldemort in the wake of his father’s imprisonment. Their self-delusions, built up by their families, start to crack, which in Draco’s case causes a major crisis of conscience. But it does cause them to take steps towards becoming better people. Based on the epilogue and interviews from Rowling, they’ve both grown up into decent men, better than their fathers. If there is hope for two of the biggest jerks in the Potter universe, then surely there is hope for any of us to break from damaging upbringing. Sometimes we realize the people we love aren’t as wonderful as we believed them to be. Or we deal with their worst traits all our lives and wish things were different. Realizing that people are people can be a hard lesson to learn. 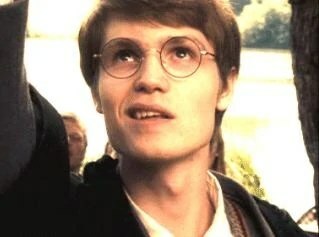 In Order of the Phoenix, Harry discovers that his father, James, was a bit of an arrogant bully when he was a teenager. He has a hard time accepting this (especially since it seems to prove Snape right). After talking with Sirius and Remus, however, he comes to learn more of the story, and how James became a better person by the end of his days at Hogwarts. Though it is initially difficult, Harry comes away with a better understanding of his father, emulating the best of James while understanding that he was his own person in the end. Luna Lovegood is said by Rowling to have had a similar realization about her father. After the Wizarding War, Luna is said to understand the truth about her father’s eccentric beliefs, accepting that some of the creatures he told her about simply weren’t real. However, Luna becomes a wizarding naturalist who discovers many unknown species, a feat which would surely make him proud. We could say this was spurred by accepting the truth about her father – learning that you couldn’t believe everything on faith alone, she dedicated herself to finding proof. 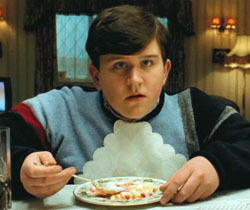 Harry also, it should be noted, basically accepts the Dursleys for all their awfulness and ridiculousness. He never accepts their behavior towards him, or thinks it was right. But he is never really bitter about it, never seeks to get back at them with anything more than light pranks. Contrast this with Tom Riddle’s behavior towards his biological family, or even Aberforth Dumbledore’s. When he leaves the Dursleys for the last time, he leaves on decent terms. He doesn’t like them, or consider their house home, but he doesn’t hate them. He accepts them as they are, and leaves them behind. By accepting family for who they are, good and bad, we can learn something about ourselves and avoid bitterness and repetition of their mistakes. That’s all I’ll be talking about for this week. Tune in next week for the second part of this article, and let me know in the comments what lessons Harry Potter has taught you about family. Learn more about the blog here, about me here, and resources here. Check out the links for related works and Pinterest boards, and leave a comment to let me know if you have any thoughts or ideas. * Note: In this analysis, I am synthesizing Harry Potter book canon, Pottermore articles, and Word of God from J.K. Rowling. I know some readers prefer to disregard Rowling’s interviews, and they should be taken with a grain of salt since spoken words are not as thought through as written work. But in this case I am taking it into consideration. This is a beautiful article. 🙂 What Harry Potter taught me about family is that everyone needs one. No one should ever have to face the world alone without a biological family, or a friend family. I also learned that the perfect family doesn’t exist, but sometimes it’s our differences and discords that teach us to respect and love those with different views in our families, but also those at work and school. Hey Emma, thank you so much! I agree, Harry Potter definitely shows us that we can’t face the world alone. As Dumbledore says, “Pity the living, and, above all, those who live without love.” I agree, also, that sometimes facing different views in our own families helps us to understand and respect different views in other environments. For example, I can definitely say having a brother who is almost my complete opposite has taught me a lot about how to be social and get out of my own head, haha.